[0:01] <xtina_> so people make images of their sd card rather than use github? [0:01] <xtina_> is that straightforwar dto do? [0:05] <xtina_> i can't imagine that happening on some other distros..
[0:06] <antisaint> Its never really broken... its just timely and tedious to repair. [0:07] <xtina_> is there a guide to repair it? [0:20] <xtina_> antisaint: wait, holy cow! [0:20] <xtina_> for some reason, --fix-missing did the trick!!! [1:24] <xtina_> antisaint: thanks for the help!! [1:36] <xtina_> btw, i'm not sure if this is the right q to ask in here, is anyone familiar with autoconf/autogen? [1:46] <antisaint> xtina_, I gtg, ill be back on here in a bit, pm me if u get hung up n ill try to toss u in the right direction. [2:25] <batch> is there a module i2c-bcm2835 ? [2:26] <batch> is i2c and spi loaded allready in the kernel for pizero? [3:10] <Psi-Jack> Alrighty. New shipment of stuff coming in. Including an Adafruit Feather HUZZAH, which has the LiPo charger/port on it. [3:22] <tjsimmons> Can you really not OC a Pi3? [3:23] <Psi-Jack> Oh, it's you again. [3:25] <tjsimmons> It's not my app. It's a service that teaches kids coding and logical thinking. [3:26] <tjsimmons> Anyhow. On an older Pi I'd OC it and problem solved. Doesn't seem to be a good/easy option with the 3 which is baffling. [3:29] <tjsimmons> So then is my assessment correct? 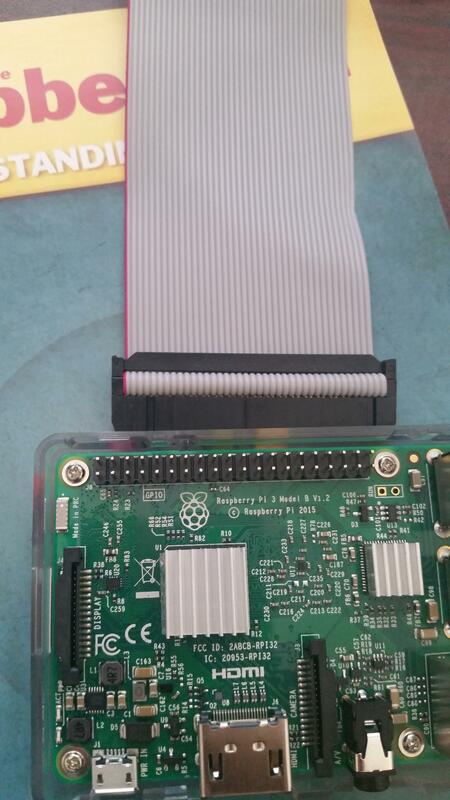 No real way to OC the Pi 3? [3:32] <pokmo> i've setup a samba server on my rpi, but file transfer speeds oscillate. [3:33] <pokmo> when it's slow, smbd almost idles. does anyone know why? [3:45] <Psi-Jack> pokmo: Wireless, Ethernet? Tell us more details. [3:45] <Psi-Jack> And the hardware.... Is.... What? [3:45] <amigojapan> hi, I have a problem with hexchar on the RPI, the end of the sentences that appear are truncated? shoudl I ask this here or in hte hexchat chanel? [3:46] <Psi-Jack> pokmo: What kind of load are you getting in general? [3:49] <Psi-Jack> Hmmm. Well, that's not tooooo bad, though. That last statement though made no sense at all. [3:52] <Psi-Jack> Are you reading, or writing? [3:52] <Psi-Jack> Ahh. Yeah. What kind of SDcard is in that unit? [3:54] <Psi-Jack> What's optop -b -o -t | grep -l kworker give you during the transfer? [3:56] <nacelle> that burned my eyes, sorry. [3:57] <Psi-Jack> And wow. Did I really miss the cat piped to grep? Ugh. [3:58] * Psi-Jack goes to wash his filthy hands from that, then his eyeballs for seeing it. [3:58] <pokmo> Psi-Jack, hmm what should i look for there? [3:58] <Psi-Jack> pokmo: I'd pastebin some of the results. [3:59] <Psi-Jack> Well, about 30 seconds or so of the results. [4:00] <Psi-Jack> Did the transfer stop or something around line 205 of that paste? [4:01] <pokmo> when _writeback = 0? [4:03] <Psi-Jack> Stopped, or finished? [4:05] <Psi-Jack> Nope. That's good, means it's written to the disk already. [4:07] <Psi-Jack> So, with that, hmm.. Somewhere else then. Put atop on there, watch it a few while it's going, see what's going on. Obvious things may start showing red on the display. [4:09] <pokmo> Psi-Jack, you mean i should see something highlighted in red? [4:10] <Psi-Jack> So it is queuing up data writes because the sdcard is slowing down. [4:10] <pokmo> is that what red means? [4:10] <Psi-Jack> What kind of USB stick is it? [4:11] <Psi-Jack> Yeah, there's your problem. [4:14] <pokmo> Psi-Jack, oh. so it's because of the slow USB rather than slow SD? [4:15] <pokmo> thanks for the help! [4:15] <Psi-Jack> Because, well, the sdcard in Raspbian is treated as an mmcblk device, not sda. [4:17] <pokmo> so i guess there's very little IO for the SD during USB writes over samba? [4:23] <Psi-Jack> My openvpn server is in my ERPOE-5. [4:23] <pokmo> actually, how secure is it to run openvpn at home? [4:23] <pokmo> more/less secure than using a 3rd party? [4:24] <Psi-Jack> How does a 3rd party even come into play here? [4:24] <redrabbit> not for "anonymity"
[4:24] <pokmo> but do you get (more) anonymity with home servers? [4:25] <Psi-Jack> pokmo: You're making 0% sense. [4:26] <Psi-Jack> VPN != anonymizer. VPN = bridge two networks with encryption over insecure networks. [4:28] <pokmo> well, i'm using the cafe next door's connection..
[4:29] <redrabbit> do you run your own network as well? [4:35] <pokmo> redrabbit, yeah. but that's just a Chrome thing, right? [4:36] <redrabbit> "obfsproxy, ShadowVPN, SoftEther, gohop..."
[5:13] <Psi-Jack> It's still related, I assure you. [5:13] <Psi-Jack> But, using a RPi for a NAS, seems a bit silly to me. [5:25] <Zardoz> I have been stating to use it. [5:39] <redrabbit> control relays, use sensors..
[6:42] <brianx> what did you find? [6:43] <brianx> hfe 200 or so. ce voltage of 50 or so. [6:43] <Psi-Jack> Well, I'm trying to actually find it, but.. Seems most people list them as Polarity, Pcm(mW), lcm(mA), and Voltage. [6:45] <brianx> voltage of 50. npn. 400mw. not sure what an lcm is. [6:49] <brianx> there are no specs on those. they also call small signal transistors "power transistors", not promising when they open with false information and omit almost everything else. [6:50] <brianx> 26 cents each in bulk isn't even cheap, you could get cheap transistors from digikey for that. [6:51] <brianx> and digi gives full specs. [6:52] <brianx> mouser is often a better choice on price. they have plenty of selection. [6:53] <Psi-Jack> That was a BJT? [6:56] <[Saint]> I'm a little bit naughty when I want a small batch of components. [6:56] <[Saint]> I usually just email the supplier and say I want a small batch for review. [6:56] <[Saint]> Usually get a dozen or so of $whatever shipped for free. [6:57] <brianx> yes, those were bjt. [6:57] <[Saint]> Admittedly, /sometimes/ that does end up in a large order. But often I abuse it. [6:59] <brianx> you don't need pre biased. [7:00] <brianx> just search npn transistor, choose the category with the most hits. [7:02] <brianx> sort by price. [7:03] <brianx> 1st one with the right package is likely great. [7:03] <Psi-Jack> Hmmm, 50V, and greater? [7:04] <brianx> yeah. a 60v might be cheaper and is good. [7:05] <brianx> get some fets while you're paying shipping. [7:06] <brianx> small ones and big ones. [7:07] <[Saint]> Boba, or Jango? [7:07] <brianx> a couple pnp as well. you need pnp less than npn. [7:07] <Psi-Jack> That's... Dirt cheap. [7:08] <[Saint]> I recently did some landscaping, and I assure you, dirt is significantly more expensive. [7:08] <brianx> yep. through hole? package should look like the ones from amazon. [7:08] <brianx> you dont need more than 50. [7:11] <brianx> that's like container. [7:12] <brianx> filter to through hole, it should be the right package by default for the cheap ones. [7:17] <Psi-Jack> Does the MHz matter? [7:17] <MartinCz> Hi. I need to read a 16 bit word from one of the GPIO pins. Each pin will stay at its level for 100 milliseconds. Firs there will be a one pulse on the pin which will indicate the data will start coming in. Then there will be 16 bits coming in, each level staying for 100 milliseconds. [7:18] <brianx> not for this. there are places it does, but you're not likely to need them until you have a lot more skills. [7:18] <MartinCz> Is there an example out there which would cover my case? [7:19] <brianx> seeing 2n5550tfr at 16 cents for 50. [7:20] <brianx> i'm not at my desk, a bit crippled. [7:20] <Psi-Jack> Ahh yes. I see it. [7:20] <[Saint]> long link is long. [7:21] <Psi-Jack> That's what she said. [7:23] <Psi-Jack> It just corrected me to say they have a lower-unitprice available for a higher quantity. [7:23] <brianx> looks like 100 then. [7:24] <brianx> I'm off to bed. will catch up tomorrow. [12:04] <reactormonk[m]> My monitor just tells me about cable not connected when I start up the pi - do I need to install an OS on the microsd beforehand, or does it have one built-in? [12:04] <reactormonk[m]> I'd expect it to have some kind of bootloader, so that should show up at least. [12:06] <reactormonk[m]> So I need the OS first? [12:08] <[Saint]> bah - close enough. [12:08] <[Saint]> TL;DR: No, there's no conventional bootloader, early init is handled by the GPU. [12:09] <[Saint]> And it reads from a FAT partition, or in later Rpis, USB/PXE. [12:10] <[Saint]> Point is, boot magic and kernel needs to be supplied from _somewhere_ that isn't the pi itself. [12:10] <[Saint]> The near complete lack of any ACT led indication should've been a hint. [12:17] <thecha> is it a good idea to have systems OS run on an external subhdd? [12:18] <thecha> would the system become more stable by using a usb stick instead? [12:32] <reactormonk[m]> Ah, I didn't assume they're real. Nice. [12:34] <reactormonk[m]> ah, us keyboard. [12:34] <mfa298> on x86 there's the concept of logical cores (which might be what you're thinking of as virtual cores) with hyperthreading. [12:43] <ShorTie> rest or change ?? [12:44] <ShorTie> reset or change ?? [12:44] <ShorTie> sudp passwd ?? [13:27] <Kerr-A> I want to send and receive communication with a device using SPI... What's the quickest way to make something happen... is there a wiring-pi utility? [14:21] <|DM|> Hello, does anyone know where I can buy raspberry pis in a physical store in milano ? [14:21] <|DM|> Also, I'm assuming the absurd markup im seeing for raspberry pi zeros is because the shortage never ended ? [14:25] <mfa298> although I think they usually have stock these days. [14:32] <|DM|> And they only have the model w anyways, so that hits 20 euros. [14:33] <|DM|> serbia, specifically, if it matters. [14:34] <|DM|> None of the others have wifi right ? [14:37] <|DM|> So I guess, in the end, no physical retailer in milano/italy stocking 0w ? [14:37] <mfa298> there might be, but you'de probably need to find someone that lives there to find out, and it may well cost as much as shipping and import anywhere else. [14:40] <|DM|> Ah well. Was worth a shot anyways. [14:44] <|DM|> is that 34 including shipping ? [14:46] <mfa298> AIUI the aim of the Zero is to be as close to zero cost as possible and to get them into as many peoples hands as possible, which is why there's the low price and limited ordering. [14:48] <mfa298> I think the 50k/month (might be more now) is more a limit of production line than anything else - the same line(s) are doing other Pi models as well so if the Zero production went up the other models would have to be reduced. [14:51] <mfa298> there's also been some production in China and Japan but I'm not sure which models they cover. [14:52] <|DM|> Oh, I see. [15:27] <rymate1234> what version of GTK does the pi raspbian image come with? [16:28] <leftyfb> rymate1234: aren't you able to check on your pi? [17:17] <Psi-Jack> openHAB is actually somewhat better than I imagined. [17:18] <Psi-Jack> Kinda more complicated to setup initially, but it does things, including, by itself, integrates with HomeKit without the need for homebridge. [17:20] <Psi-Jack> And.. Most of all, it can integrated directly into a touch screen panel with voice recognition. [17:42] <GenteelBen> Aren't most engineers bald, baldengineer? [17:43] <GenteelBen> Bald or balding. [18:25] <Psi-Jack> I wonder how hard it would be to make a decent custom-made smoke+co+lpg sensor that was reliable enough for home use. [18:25] <Psi-Jack> I see things like the MQ-2 sensor for potentially this kind of thing, just don't know how reliable such a thing would be. [18:34] <Psi-Jack> Hmm, I suppose maybe the MQ-2 might be more than sufficient for what I'm aiming for. [18:41] <jsgrant-_> Is a pi-top worth the money, for a 'luxury item'? Don't plan on using it day-to-day -- but would be nice to throw a tiling wm on there and play around. [18:41] <jsgrant-_> Hard for me to justify paying 200+usd for it though. [18:44] <jsgrant-_> Chillum: In-regards to me? [18:45] * jsgrant-_ more-so like the idea of a trivial means to a battery & the fact that it's somefactor of "modular"; Though obviously by no way is this exclusive to it. [18:47] <jsgrant-_> If that price point just bordered a-little above 100usd ... they'd probably sell a lot more units; But yeah, it really doesn't offer anything besides a somewhat nice pre-built formfactor. [18:49] <jsgrant-_> Maybe in 10+ years, there will be a big enough hobbyist market around Risc-V & w/ home-fabrication/advanced 3d-printing,, that it'll satisfy my pephrially-based bloodlust. [18:52] <Psi-Jack> brianx: Heh, my scope just arrived. [18:57] <polprog> Psi-Jack: what make and model? [18:57] <Psi-Jack> Heh, I love how the instructions start off with "If your kit does not have SMD devices pre-soldered...."
[18:58] <Psi-Jack> polprog: It's a Kuman JYE Tech DIY kit. [19:01] <Psi-Jack> I love how Step 1, is... Check the main board by plugging in the 9V power supply, and checking the buttons, which are in the bag not on the board. [19:08] <Psi-Jack> Oh, even better. Step 1 is to check the main board by powering it up, and part 3 of that is to test the buttons (after they have been installed). Like, wow guys..
[19:09] <Psi-Jack> Yeah, I think I'll start on this tomorrow when I have the proper tools to really do this right, and easily. [19:17] <Psi-Jack> Yeah, it's just an SMD resistor. I got the solder wick also arriving tomorrow, I think. [19:17] <Psi-Jack> Yeah. That's in tomorrow's shipment. [19:45] <Psi-Jack> So, not the 15Msa/s I as expecting it to be. But, eh. It'll work for some things. [19:47] <Psi-Jack> I have basically 3 segmented networks. [19:47] <Psi-Jack> 1, my server network. 2, my regular computer network, and 3, my IoT network. [19:48] <Psi-Jack> I just have some specific ACLs and firewall rules that allows the regular network access to the IoT network without having to jump onto a different access point. [19:52] <Psi-Jack> Heh. Yeah. I have the UAP-AC-Lites for my home, both passive PoE connected by dedicated cat6 lines. [19:54] <Psi-Jack> What I'm likely to do in the end, because having too many AP's in one small area will cause interference, especially in the 2.4GHz range as these ESP8266's are using, it'll be problematic. [19:55] <Psi-Jack> So I'll likely move the IoT to the normal network, and isolate each module by MAC with ACLs, and VLAN them as well. [19:55] <Psi-Jack> Hmmm.. Well, I need.. Food. [20:24] <mfa298> jmadero: .bashrc is used by the shell when logging in, it's not the place to put things to run on startup. [21:10] <Psi-Jack> systemd service unit, definitely for something that should be running persistently as a system service. [21:31] <brianx> Psi-Jack: i did a search on the cheap 2N5550 over at mouser and $6.60 for 100 of them over there. i didn't search for anything cheaper. [21:32] <Psi-Jack> brianx: Wow, that is pretty cheap. [21:35] <brianx> mouser doesn't search as well, but it is usually cheaper. given how non -critical today's application is, mouser's search is enough. [21:38] <Psi-Jack> jmadero: how did you "add it to systemd?" [21:40] <brianx> Psi-Jack: searching by spec on mouser resulted in several choices at $5.70 per 100. [21:41] <brianx> $2.72 per 20. [21:41] <Psi-Jack> jmadero: For starters, that's wrong. /etc/systemd/system is where you should be putting that since it's custom. And chmod? Why did you chmod? How did you reload, how did you enable? [21:41] <Psi-Jack> brianx: Yeah! That works! [21:41] <Psi-Jack> I didn't ask what you followed. I asked what you actually did. [22:20] <brianx> Psi-Jack: 1N5226BTR looks good at mouser. i suggest getting a dozen different voltages. from 2v up to 30v. [22:26] <Psi-Jack> Those are more specific to the required voltages, eh? [22:27] <Psi-Jack> Is that for the Vf you mean 2V-30V? [22:27] <brianx> the one i listed is a 3.3v which is what this project needs. that series likely comes in dozens of values. [22:27] <Psi-Jack> Ahh, Vz, gotcha. [22:44] <nealshire> hey really quick, what's the correct orientation for a gpio ribbon cable? [23:26] <polprog> what did ben heck use? [23:27] <Psi-Jack> Hmmm, where's a good place to get 2-lead wire, 22AWG stranded? [23:28] <Psi-Jack> Heh, Radio Shack filed bankruptcy. [23:28] <Psi-Jack> Seems they shut down the two local stores they had had here. [23:29] <Psi-Jack> I was looking on Aliexpress, but I can either get black pvc insultated, or red and white insulated, but what I actually want is white pvc insulated. [23:39] <d0rm0us3> So for some strange reason 'sudo apt-get upgrade' overwrote your configs?!? [23:46] <Kerr-A> huh... sudo su gives me a message: "Sudo: unable to resolve host raspberrypi"
[23:46] <l33n> is samy here? [23:50] <mfa298> Kerr-A: you learn more from going throguh the log files to determine why it's not doing what you expect. [23:53] <l33n> has anyone ever used poison tap?